At this price, all four NanoMods are well worth your attention. Could do with some more modern additions. A series of four pocket-money Kontakt instruments (Rich Pads, Cool Reeds, Kick, Hot Brass) utilising samples from a range of classic and vintage hardware synths in a very straightforward common interface to create their titular tones. "Kick offers a choice of eight waveforms, while the other three Nanomods enable two preset waves to be mixed to taste"
Kick offers a choice of eight waveforms, while the other three enable two preset waves to be mixed to taste. 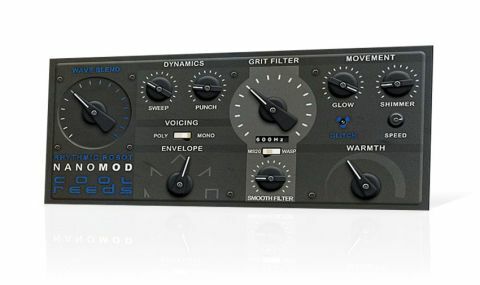 The "intelligent" controls (including the 16-step convolution Grit Filter, which uses IRs from the MS-20 and Wasp synths and sounds fabulous) 'cross-reference' each other to operate a range of behind-the-scenes settings aimed at optimising the character of the sounds. There's also a similarly intelligent 'randomise' button onboard. At this price, all four NanoMods are well worth your attention, although we'd love to see some more adventurous, modernistic colours added to their collective palette.